Well. I have had it. I mean, actually, I’d “had” it yesterday. I am done with that thing. Done with it. I was depressed all weekend because of that dad gum thing and the dad gum number it kept showing me. I am done being defined by it. 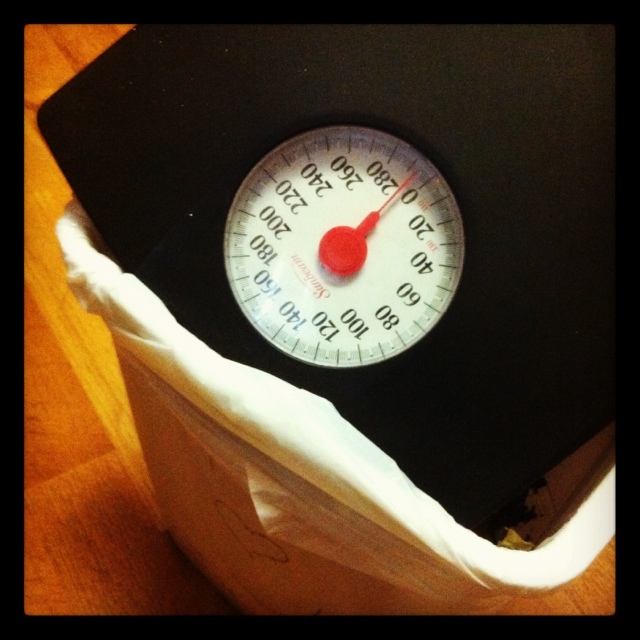 I am done weighing. I don’t care anymore what it says. I’m done. I will not weigh myself again. Do. not. let. me. And let me just tell you what he did. He got off the scale, picked it up, walked into our kitchen, pulled the trash out and held it out over the trash. Then he said, “Ya wanna do it with me?” And we tossed that scale into the trash. And I know (well, I mean, I have a decent idea) what is at that finish line. And I know that the race gets better the closer I get to Him. And I don’t want to wait any longer than I have already had to wait to get closer to Him. So I’m leaving that weight behind cause it was tripping. me. up. And I’m running with endurance this race to the face of my Jesus. And for a girl that doesn’t like to run… well, this is a kind of race that even I am willing to train for! “And I’m running with endurance this race to the face of my Jesus.” — Love This Word Picture. To the face of my Jesus! Love it!